Hometown: Brigantine, New Jersey, U.S.
Died: January 2, 2004 in Operation Iraqi Freedom. Unit: Army, 2nd Battalion, 325th Airborne Infantry Regiment, 82nd Airborne Division, Fort Bragg, NC. Spc. Marc S. Seiden of Brigantine, New Jersey was looking forward to coming home after serving nine months in Iraq. But he never made it. Three weeks before his unit was to return to the states, he was killed. He grew up in East Windsor, N.J., one of two sons of Jack and Gail Seiden. He was a 1995 graduate of Hightstown High School, where he played soccer. He attended Ramapo College, where he also played soccer, and worked in construction before enlisting in the Army seven months after the Sept. 11, 2001 terror attacks. An outgoing man and avid fisherman, Seiden joined up partly in response to the attacks. Seiden, who had been decorated with a parachutist's badge, a National Defense Service ribbon and a Combat Infantryman's Badge, will be awarded a Purple Heart and Bronze Star posthumously. He was 26. BRIGANTINE, N.J. — After nine months in Iraq, Army Spc. 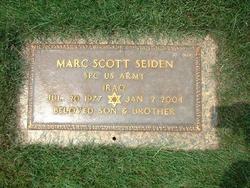 Marc S. Seiden was looking forward to coming home. But he never made it: Three weeks before his unit was to return to the states, he was killed in Iraq. Seiden, a 26-year-old paratrooper from Brigantine, died Jan. 2 when his convoy was ambushed in Baghdad, killing Seiden and another soldier. Their unit, 2nd Battalion, the 325th Airborne Infantry Regiment of the 82nd Airborne Division in Fort Bragg, N.C., is scheduled to return to Fort Bragg, N.C., later this month after nine months in Iraq. 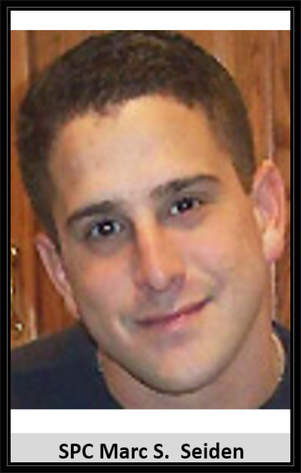 Seiden grew up in East Windsor, N.J., one of two sons of Jack and Gail Seiden. He was a 1995 graduate of Hightstown High School, where he played soccer. He attended Ramapo College, where he also played soccer, and worked in construction before enlisting in the Army seven months after the Sept. 11, 2001 terror attacks. An outgoing man and avid fisherman, Seiden joined up partly in response to the attacks, according to Ferri, his steady of 2" years. “He’d wanted to do it for a long time, but it just kept getting pushed off. But then 9/11 happened, and it hit him hard. He wanted to do something about it. That was the way he was. For him to deal with something, he had to just jump into the middle of it,” she said. After beginning his six-year enlistment, he underwent basic infantry training and parachute school at Fort Benning, Ga., before being assigned to Fort Bragg, N.C. Sent to Iraq just before the start of the war last March, Seiden was active on patrols in and around Baghdad. The day he was killed, the convoy he was riding in came under attack from a bomb, a rocket-propelled grenade and small arms fire, according to military officials. Seiden and Army Specialist Solomon C. Bangayan, 24, of Vermont, died. Three others were wounded. Seiden, who had been decorated with a parachutist’s badge, a National Defense Service ribbon and a Combat Infantryman’s Badge, will be awarded a Purple Heart and Bronze Star posthumously.